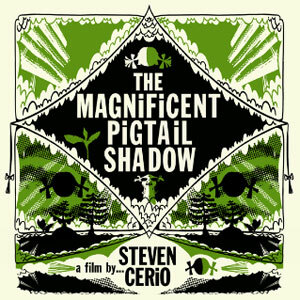 Uber-prolific artist and musician Steven Cerio has released a riveting gem of an aural/visual soliloquy on his latest work The Magnificent Pigtail Shadow , available with a stunning limited edition silk-screened art book from Noiseville the venerated and venerable DIY label from NYC. Cerio’s incredibly detailed, whimsical and psychedelic artwork has earned him a solid reputation over the years, bolstered somewhat by his status as the official artist (in residence, ha!) of The Residents as well as poster designer for the likes of Les Claypool and King Crimson. The 45 minute film is to be prefaced with a short context where Cerio explains frankly and with candor his journey in the desert of southern Arizona to spread his deceased mother’s ashes somewhere beautiful. As he’s doing this he’s treated to a rare trick of shadow that resembled an old picture of his mom, as a young woman in pigtails, stretching out for miles in the desert. So begins a lovely but deeply affecting meditation on casting off the illusory intricacies of life and let the mind and spirit be at play with form and experience. What’s amazing about the film primarily is the ability to sustain the hallucinatory experiment with layered form, keeping always within the “organic rurality” of the frame, there never seems to be any degree of flakiness or New Age-y pseudo-mysticism lent to the imagery. As we refract, focus and recede again on the kaleidoscopic beauty of the images that just sing on the screen, there is not a speck of airy-fairy stuff or mushroom-y cheesy-ness that could turn the experience into so much burnout raver-ready dreck. This is a poised, very personal and fraught statement that carries with it both a childlike sense of play and maturity. The viewer and listener must at some point just let go and stop trying to rationalize the narrative. In that sense, it’s a truly meditational work, one that describes the opening of perception while at the same time working toward the same state in the audience. The visual aspects are so stunning, you almost forget that the music is equally so. 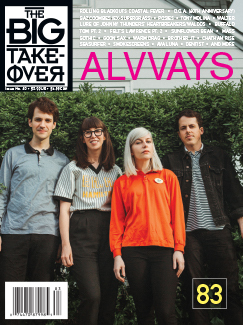 Mirroring the dream-like quality of the visual layers, the music, too is a constantly morphing soundscape, recorded by Cerio and involving a lush lineup of great players, including members of Destroy All Monsters and Yo La Tengo all swishing around under the huskily-voiced narration of Throwing Muses‘ Kristin Hersh. A work of singular beauty that triumphs in it’s ability to evoke deeply archetypal allegories out of relatively simple imagery and opening perception in it’s glyph-laden but still easily epistemological view of the “natural” world as it scrapes trippily across our human need for compartmentalization and supreme control. The Magnificent Pigtail Shadow cajoles us quietly to part with that drive to shelve and parse our perceptions, seeing patterns and beauty in the mundane and the chaotic, while sharpening and receding focus to see what happens when you obfuscate and layer those perceptions. A highly pleasing and successful bout of constructive and cathartic cloud-busting daydream with feet planted firmly on earth.